Each year, about 4,000 children and teens in the U.S. are diagnosed with brain tumors—the most common pediatric solid tumor. The Aflac Cancer and Blood Disorders Center offers a team of providers with specialized expertise in treating all forms of childhood brain and spinal cord tumors. 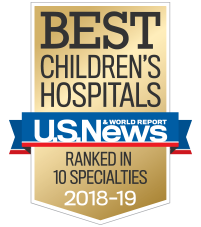 Each year, our program cares for more than 120 newly diagnosed patients with central nervous system (CNS) tumors, making us one of the largest treatment centers for pediatric brain cancer in the country. By using diverse treatment protocols, including state-of-the-art neurosurgical techniques, radiation treatment, chemotherapy with peripheral blood stem cell transplantation, and highly innovative phase I and phase II trials of novel agents for children whose cancer has relapsed or is not responding to standard treatment, we offer comprehensive medical care for patients of all ages and with all stages of disease. The Aflac Cancer and Blood Disorders Center is home to one of the largest childhood cancer programs in the country, following more than 700 children and young adults with brain tumors each year. Combining the latest proven technology and research with a caring, child-friendly approach makes the Aflac Cancer Center a top choice for the treatment of childhood brain and spinal cord tumors. We have seven pediatric brain tumor physicians and researchers, making us one of the largest single-center pediatric groups assembled for this disease. We offer innovative treatments for childhood brain and spinal-cord tumors through NIH-sponsored clinical trials, providing the most cutting-edge treatments for brain tumors through the Children's Oncology Group (COG) Phase I Consortium and other multicenter sponsored trials. We are one of 18 members of the Department of Defense Neurofibromatosis Clinical Trials Consortium, offering innovative clinical trials specifically for patients with neurofibromatosis (Type I and Type II). We are a member of the prestigious Pediatric Brain Tumor Consortium (PBTC)—one of 11 centers nationwide. We offer advanced imaging and neurosurgery capabilities, such as MRI software and techniques, an intraoperative MRI system, positron emission tomography (PET) scanning, Gamma Knife technology, and stereotactic radiosurgery and radiotherapy. We are one of only two institutions in the country offering a first-in-pediatrics clinical trial using Indoximod, an inhibitor of an immune "checkpoint" pathway used to treat pediatric patients with refractory malignant brain tumors. In collaboration with Georgia Tech, our team is developing nanoparticles for drug delivery across the blood-brain barrier to specifically target pediatric brain tumors. We offer a cancer survivor program to help with late effects which may include physical, psychological and social challenges. We have physicians and physician scientists with national and international leadership roles in developmental therapeutics and the diagnosis and treatment of childhood medulloblastoma, glioblastoma, diffuse intrinsic pontine glioma (DIPG), atypical teratoid rhabdoid tumor (ATRT) and infant malignant brain tumors. We are one of 21 members of the Children's Oncology Group (COG) Phase I Consortium, allowing us to offer the most cutting-edge treatments for all children with refractory brain cancers. Our team of National Institutes of Health (NIH)- funded, translational researchers has directly applied new knowledge and advances developed within our laboratories to clinical trials aimed against childhood brain cancer. We have developed a robust pediatric brain tumor biorepository and xenograft core, which provides tumor tissue and cells to investigators throughout the country so that we may contribute to advancing science nationwide towards the cure for pediatric brain cancer. We are home to one of the nation’s leading inpatient and outpatient rehabilitation programs. The Aflac Cancer Center is committed to advancing research and medicine by developing new techniques, treatment and cures for children and young adults with brain tumors. We are home to one of the largest clinical trial programs in the country—offering our patients access to some of the most novel treatment options in the country. Tobey MacDonald, M.D., Director of the Aflac Cancer and Blood Disorders Center’s Neuro-Oncology Program, helped to initiate the “first in child” clinical investigation of Indoximod (immunotherapy targeting the IDO immune checkpoint pathway) for the treatment of children with all types of refractory brain tumors. He is also one of 8 members on the NIH Brain Malignancies Steering Committee and a member of the FDA Pediatric Oncologic Drug Advisory Committee, which work together to help to shape the future direction of national clinical trials for pediatric brain tumors. Dr. MacDonald was recognized by U.S. News & World Report in 2016 as a top pediatric oncologist in the country.